Don Klase (R) President of OSRAM North America presents Roberto Gonzalez (L) with the OSRAM’s prestigious Above and Beyond award. 25 March, 2015 (Tucson, AZ) – OSRAM Opto Semiconductor held their annual OSRAM North American Sales Conference. 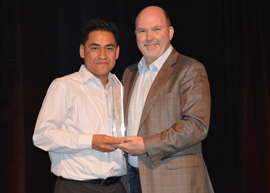 During this year’s ceremony Everest Sales and Solution’s very own Roberto Gonzalez was honored for his above and beyond design and support for OSRAM and for his outstanding management of Everest’s SKYLAB electronics design house. Congratulations to Roberto for his award. We wish him continued success in his endeavors.